The image below appeared in this week's New Statesman. I read that a comparison is being drawn between the political campaign currently being undertaken by David Cameron and the quest which was undertaken by Frodo Baggins in my work “The Lord of the Rings”. In particular, I am informed that Mr Cameron is compared with Frodo; Boris Johnson with Sam; Michael Gove and George Osborne with Merry and Pippin; Oliver Letwin with Gandalf; Gordon Brown with Sauron, and David Davis with Gollum. Furthermore, I distinctly heard a participant on this morning’s “Today” programme compare Mr Davis with Aslan, a lion who appears in Chronicles of Narnia, a work written by my fellow Inkling, Professor C S Lewis. 1) As readers of my work know, Frodo offers the ring of power to Gandalf. I am unaware that Mr Cameron attempted to withdraw from nomination as leader of the Conservative Party while simultaneously offering to nominate Mr Letwin for that position. Frodo also offers the ring to Galadriel. I have no knowledge of any offer made by Mr Cameron to Theresa May. May I add that, in my view, Galadriel was most unwise to refer to Bilbo Baggins’ long-expected party as “the nasty party”. Her comments have proved extremely damaging to the morale of ordinary hobbit workers on the ground, or rather under it. 2) As readers also know, Sam is compelled to borrow the ring from Frodo, and later returns it. I am not convinced that Mr Johnson would return the premiership to Mr Cameron on demand. 3) The comparison between Gollum and Mr Davis (or Smeagol) seems to me a little wide of the mark. Gollum, remember, has previously possessed the ring. If the comparison of which I have read is to be applied accurately, Gollum must surely be a former Prime Minister who believes that he (or perhaps she) has been unjustly deprived of office, but will in due course be reinstated in 10 Downing Street. It would be impertinent of me to speculate about the identity of such a person or persons, and I must therefore leave any necessary identification in the hands of your readers. 4) The comparison identifies Oliver Letwin as Gandalf. It does not, however, identify a Saruman. 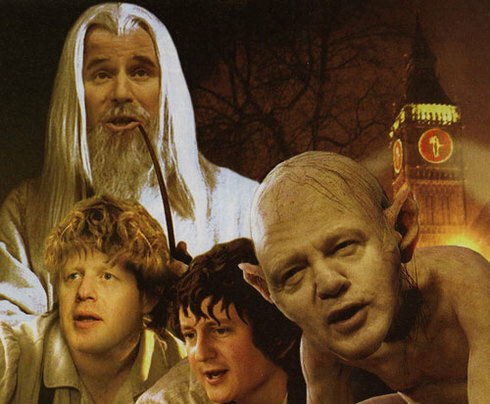 Mr Letwin’s Shadow Cabinet colleague David Willetts is clearly also a wizard, but any identification of Mr Willetts with Saruman is deeply problematic. Saruman, after all, goes over to the Dark Lord – in this instance, Gordon Brown. It is true that Mr Willetts refused to nominate Frodo for the leadership. But there is nothing in Mr Willetts’ character or outlook to suggest that he will cross the floor of the Commons to join New Labour. A more apt identification, perhaps, is with the late Enoch Powell, who urged hobbits to “Vote Mordor” during the 1974 general election, arguing that the identify of Rivendell was threatened by an uncontrolled influx of elves and dwarves. 5) Mention of Rivendell leads me, finally, to the Council of Elrond. The comparison does not refer to the council. At first glance, the council would appear to be modelled on the weekly meeting of the 1922 committee – for men in grey suits, read elves in grey robes. It has been put to me that the council cannot be confused with the 1922 committee, since the council actually reaches a decision. I naturally reject this argument, preferring instead to note that the council is not a meeting of hobbits only, but of a wide variety of different peoples. In summary, the council is nothing less than a potential coalition government. Is Legolas a Liberal Democrat? Is Gimli a Scottish Nationalist? Is Mr Cameron planning a potential deal with Mark Oaten? I think we should be told. Finally, may I offer sincere apologies to all your readers. Though myself the author of a work of fantasy, I confess that it is deeply depressing to find that some Conservatives (with Members of Parliament apparently among their number) are incapable of leaving childhood and of growing up. They attempt to escape the harsh reality of adulthood. They retreat into a comforting world of adolescent invention. In saying so, I am not of course referring in any way whatsoever to the political aspirations of those associated with either the Cameron or Davis leadership campaigns.